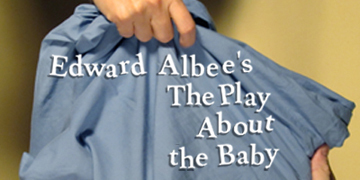 Edward Albee’s "The Play About the Baby"
Exquisite Corps Theatre will present "The Play About the Baby," by Pulitzer-Prize winning playwright Edward Albee (author of "Who’s Afraid of Virginia Woolf," "Seascape" and others). Performances are set for March 7 - 31 at the Black Box Theatre at the Boston Center for the Arts, 539 Tremont Street in Boston's South End. In Albee's "once upon a time" classic, there was a Boy, a Girl and their Baby. They all lived together in idyllic bliss, far away-- or so they thought -- from anything that could harm them. One day, however, a strange Woman and an even stranger Man found them. Suddenly, there were only questions and memories, hopes and fears, truths and lies. Directed by Adrienne Boris (Founding Managing Director of Exquisite Corps Theatre), the company features Zachary Eisenstat, Lynn R. Guerra, Janelle Mills and Bob Mussett. In August 2009, Exquisite Corps presented its inaugural production of "Love’s Fire: Seven Short Plays Based on Shakespeare’s Sonnets" at the Arsenal Center for the Arts Black Box in Watertown, MA. The company then produced "Infinite Story (interconnected new plays)" at Boston Playwright’s Theatre in September 2009 followed by a critically-acclaimed staged reading of "The Two Gentlemen of Lebowski" by Adam Bertocci at The Factory Theatre in February 2010. In April 2010, the company mounted its first full length play, "Limonade tous les Jours" at The Arsenal Center for the Arts Black Box. For information and tickets, call 617-933-8600 or visit www.exquisitecorps.org.